Currently, the energy storage is dominated by banks of batteries, but other forms of energy storage are beginning to appear alongside them. CAES is one of them. 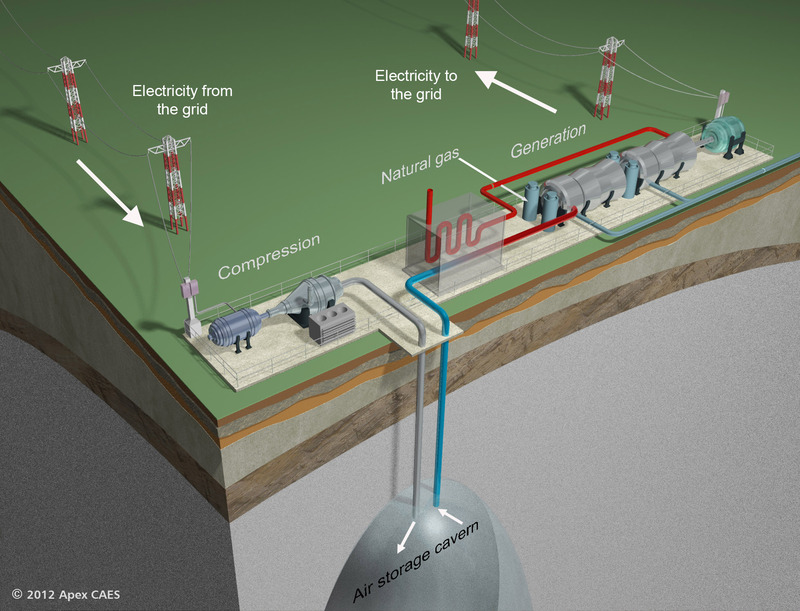 Compressed air energy storage (CAES) uses surplus energy to compress air which is then stored in an underground reservoir. The compression of the air generates heat. The air can be released to a combustor in a gas turbine to generate electricity. The aim of course, along with other forms of energy storage, and other approaches such as smart grids and demand reduction strategies, is to provide a means in which intermittent renewable energy such as solar and wind can take over from fossil fuels. The first such system was a 290 MW plant developed by E.ON-Kraftwerk at Huntorf, Germany, in 1978. The intention was to help manage grid loads by storing electricity as pressurized air during night-time when demand was low and releasing it again when demand increased. The plant is still operational, being used for backup power. The compressed air, as with a number of other such systems, is stored in underground salt caverns which take 8 hours to fill at a rate of 108 kilograms per second. When electricity is needed again, the compressed air is released and heating by burning natural gas. The expansion of the air drives a 320 MW turbine for 2 hours, after which the caverns have to be refilled. Although most other CAES plants operate along the same principle, they have tended to focus additionally on retaining the heat produced during the compression process, which increases the efficiency of the plant as a whole. There are three ways of dealing with the heat produced during compression. Adiabatic storage plants retain the heat and reuse it to release the compressed air, making the plant 70 to 90 percent efficient. Diabetic storage plants dissipate the heat into the atmosphere via heat intercoolers, with another source of heat being used to release the air for the turbines when it is needed. Finally, there are Isothermal storage plants that employ heat exchangers to try and keep the internal and external temperatures equal. The heat produced during compression is, again, released into the atmosphere and another source of heat brought in when the air needs to be released. Of these three methods, most companies are now trying to find ways of retaining the heat initially produced by the compression process. Just recently, two North American energy storage companies, General Compression and NRStor, have been working to develop a proposal for energy storage in Ontario, with support from an asset management group called Northwater Capital Management. The aim of the CAES proposal is to help provide value for bill payers by using energy storage to integrate wind power into the grid and also by enabling load leveling, in which energy storage at night, when demand falls, with a view to bringing it back on to the grid in the morning, when demand rises again. This would reduce the need for fossil fuel turbines. A General Compression Advanced Energy Storage (GCAES) system has been developed by General Compression, with a prototype in Gaines, Texas. This is powered by a 2 MW wind turbine and uses an underground salt cavern as an air reservoir. It can deliver 1.6 MW of energy for a maximum of 150 hours before it has to be recharged. Unfortunately, the heat generated by CAES systems makes air expand, thus making compression a problem. Furthermore, when the compressed air is released, it cools and this reduces the amount of energy available. There can also be a problem with the build-up of ice. The burning of natural gas can address this problem by warming the de-compressing air, but this is costly and produces carbon dioxide. The GCAES system addresses these problems by capturing the heat and storing it in a pond, it subsequently being used to warm the air released during the generation cycle. Calculations conducted so far have shown the installed cost of long-duration storage to be one-tenth of the cost of lithium-ion battery storage. In Ireland, renewable energy company Gaelectric is planning to build a £300 million CAES facility for which it will have to build new underground salt caverns. This plan has caused some controversy, with claims that the company might use them for waste disposal after the completion of the project. Other concerns have been raised about the proposal to pump brine into the sea which might adversely impact marine life. However, it might equally be the case that these concerns have been massaged to some extent by local anti-renewables campaigners concerned at visual impact. California company LightSail Energy is also working on CAES. Co-founder and chief scientist, Danielle Fong, says her company’s aim is “to produce the world’s cleanest and most economical energy-storage system”. LightSail Energy intends to do this by capturing the excess heat produced by the compression process which previously has been wasted. Its approach incorporates an energy storage element and high-pressure storage tanks for natural and industrial gases. The energy storage device is still in development but the company is planning to sell the storage tanks to logistics companies that distribute and recover natural gas and also to compressed natural gas refueling stations. Similar tanks will be used in the company’s energy storage product when it has been fully developed and is ready for commercialization. The revenue raised by the natural gas storage tanks will also help to create profits and production capability for the energy storage solution. LiGE is developing an off-grid energy storage system, based on CAES and constructed of custom-built components. These include the electronics in the control monitoring and reporting software, the composite pressure vessels which are made to a ‘zero fatigue’ requirement and are explosion-proof. The system also measures heat, pressure, vibration, flow rates, current, voltage, and a number of security measures. The storage system is intended to be tamper-proof, in that any attempt to tamper with it will shut the system down and depressurize it. The only way the container holding the system can then be reopened is by a LiGE technician summoned from head office. Similarly, only LiGE technicians will be able to maintain and commission it. The system uses power generated mostly, but not exclusively, from solar. This drives a hydraulic motor which in turn drives a compressor. The compressed air is stored in air tanks and the reverse operation drives an alternator which supplies the power to whatever establishment the energy storage system is serving, be it a factory or other building or whatever. LiGE estimates the efficiency of the system to be in excess of 90 percent. In addition to serving in an off-grid role, it can also be used for uninterruptible power supply. Energy storage, in whatever form, will have to play a vital role in our energy networks as more energy is generated from renewable sources. For example, it has been estimated that the UK will need to store about 200 GWh of electricity by 2020. CAES is increasingly looking like it could become a very viable and regularly employed method of doing just that.